From all new cabinets to new appliances, this kitchen renovation was a beautiful transformation. Glass door upper cabinets with LED lighting allowed for the owner to showcase her favorite trinkets in a classy way. 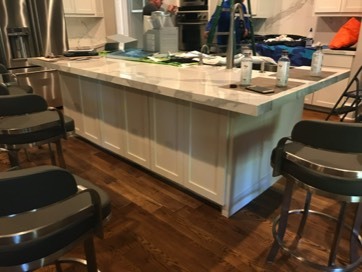 New island cabinet and granite throughout along with a new back splash tile and this kitchen is ready to entertain. 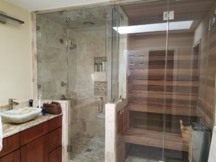 This was a master bathroom renovation. 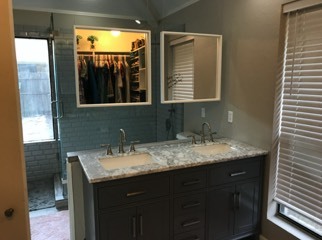 We reconfigured the whole bathroom which included moving the shower to the opposite wall and removing the existing windows, removing the separation wall between the vanities. A kitchen renovation was the goal of this project. 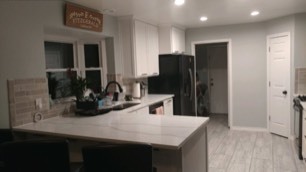 From widening the entrance to the kitchen from the dining room and changing the outdated look of her cabinets, Renovision added value and comfortability to an area that she loves to entertain her family in. Another kitchen renovation project. 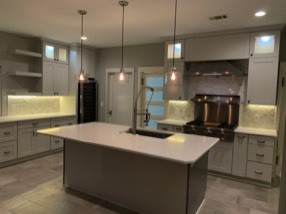 The client wanted to update her kitchen to be the focal point for entertaining while maintaining an elegant look and feel. 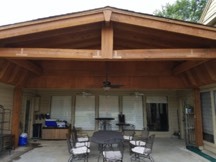 RenoVison can help make your outdoor experience more enjoyable for you and your family. If you like to entertain, we can help create that perfect setting while maintaining your budget. Contact us today for a free quote. Steam rooms and saunas are not only great for relaxing. They are also beneficial to your health. Studies show steam rooms can improve cardiovascular health and circulation which can lead to lower blood pressure and a healthier heart. Steam also promotes healing of broken skin tissue. RenoVision can help you see your vision before construction even begins. We can provide multiple drawings from various angles with different style and color choices.